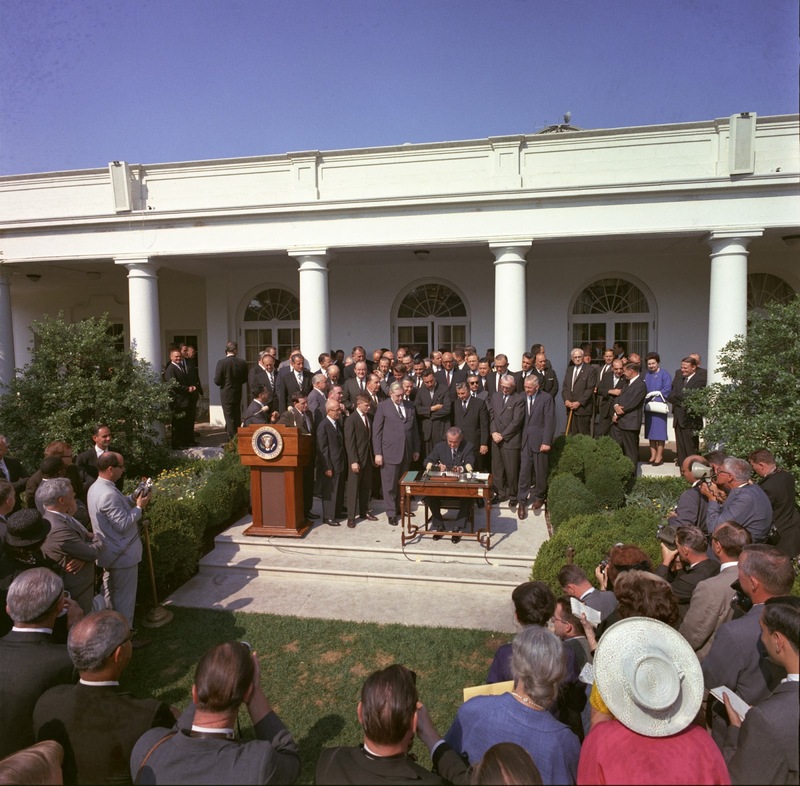 President Lyndon B. Johnson signs the Poverty Bill (also known as the Economic Opportunity Act) on Aug. 20, 1964, while press and supporters of the bill look on. LBJ Library photo by Cecil Stoughton, available via Creative Commons. On the year of the fiftieth anniversary of the War on Poverty, President Barack Obama announced his Promise Zones Initiative to renew President Lyndon Johnson’s vision of ending poverty in places that Johnson said were on the “outskirts of hope.” Designated Promise Zones would be given priority funding for federal grants programs, technical support for improving intergovernmental and public-private cooperation, and tax incentives for business investments. The inclusion of Los Angeles in the launch of this initiative is symbolic because the city has been the testing ground in fierce debates over federal involvement in the nation’s cities since the War on Poverty experiment was launched. In the wake of the 2008 economic crisis and Occupy movement, economic inequality is once again on the agenda. How we remember the legacy of these programs, and how they continue to evolve, is part of the contemporary debate over policies that might effectively respond to poverty and deepening inequality. President Ronald Reagan issued one of the most famous rejections of the War on Poverty when he declared in the mid-1980s, “I guess you could say, poverty won the war.” By equating poverty with dependency, the expansion of Great Society programs like Medicare, Head Start, and neighborhood health centers by definition become indicators of poverty rather than programs that work to combat it. Far from being a failure, the Center on Budget and Policy Priorities concludes that government programs are responsible for cutting the poverty rate nearly in half. This finding is based on the Census Bureau’s Supplemental Poverty Measure, which includes cash income, non-cash benefits, and tax credits (also see this Columbia University study). Without these government programs, 40 million more people would have been living in poverty in 2012 than without government programs. Still, nearly 50 million people were counted as poor in 2012, and there is a tremendous racial gap in poverty rates with the white rate at 14% compared with 25.8% among African Americans, 16.7% among Asian Americans, and 27.8% among Hispanic people. These rates also vary at the regional and urban level. A Public Policy Institute of California study finds that the rate of poverty for Los Angeles County is higher than the statewide average. And within the county, the rate of poverty is more than twice as high in South Los Angeles as compared to West LA, contributing to a mortality rate that is almost twice as high. Under Presidents Reagan and George H. W. Bush, rolling back federal programs that created “dependency,” broken families, and a wasteful tax burden amounted to a hands-off agenda for the nation’s cities. But the deeply uneven effects of government abandonment, economic disinvestment, and policing once again erupted in the city. Following the 1992 Rodney King uprising, President Bush responded with the idea of enterprise zones, which would offer tax incentives to attract private investment for job creation, as well as housing investments and crime control money. Incoming President Bill Clinton took up this idea and repackaged it as empowerment zones, a move that reflected both a rejection of “traditional liberal responses” to poverty and an embrace of self-help. While tapping into the War on Poverty legacy of community-based projects, Obama’s Promise Zones Initiative remixes the Bush and Clinton mantra of public-private partnerships, whose record on poverty is uncertain at best. The $500 million Los Angeles could gain through the Promise Zone Initiative is more than the $137 million in housing moneys Bush promised 20 years ago, but neither of these programs actually represented new funds, and the $500 billion in tax exemptions for Obama’s overall program have not yet been passed by Congress. Moreover, there are concerns that this money might also fuel gentrification in the Pico-Union neighborhood, where people are already being displaced by rising rents. in the White House Cabinet Room in March 1966. I knew that America would never invest the necessary funds or energies in rehabilitation of its poor so long as adventures like Vietnam continued to draw men and skills and money like some demonic, destructive suction tube. So I was increasingly compelled to see the war as an enemy of the poor and to attack it as such. King’s diagnosis for the failure of the War on Poverty has largely been missing from the 50th anniversary discussions of how we remember, and continue to debate, its legacy. Unlike Reagan, the dependency that King questioned was the nation’s reliance on war-making, which both drew money away from supporting human needs and distorted national values. It was as if some strange madness was in control of man, compelling him on the one hand to build great hospitals for the sick, while at the same time he was spending even more money to build instruments that could make more wounds than all his hospitals could take care of. Within the context of a war-making society, hospitals can appear as band-aids, institutions whose efforts are outstripped by the deadliness of war-making and military priorities. But Clarke’s thinking also suggests that the closure of safety net hospitals, including King Hospital, is part of the collateral damage of war-making. 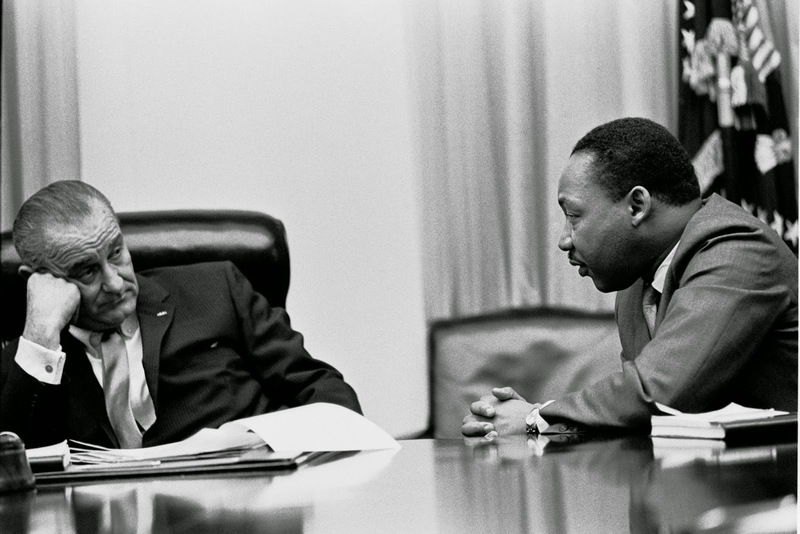 Can Dr. King’s and Mary Clarke’s visions guide us to push for more than (broken) promise zones? They embolden us to ask where the money is to fight poverty, and to include military spending as one part of the answer. The $500 million (over 10 years) that Obama proposes pales in comparison to Los Angeles County’s share of defense spending, which the National Priorities Project pegs at $18.28 billion for 2014 alone. That sum would cover the county’s 2013-2014 $7 billion health and sanitation budget, $6 billion public assistance budget, and most of the LA Unified School District’s $7 billion budget. For the past several years, the US Conference of Mayors has passed resolutions calling for the end of wars in Afghanistan and Iraq, the elimination of nuclear weapons, and reinvestment of defense dollars in creating a “sustainable economy for the 21st century.” These resolutions and the nomination of the National Priorities Project for the 2014 Nobel Peace Prize recognize that ending war is linked to ending wars on the poor. Fulfilling the unfinished peace and justice agenda that we inherit from the 1960s and 1970s is the real promise for creating healthy cities. Jenna M. Loyd received her PhD in geography from the University of California, Berkeley, and is assistant professor of public health policy and administration at the Joseph J. Zilber School of Public Health at University of Wisconsin–Milwaukee. She is author of Health Rights Are Civil Rights: Peace and Justice Activism in Los Angeles, 1963-1978, and coeditor of Beyond Walls and Cages: Prisons, Borders, and Global Crisis. "Health Rights are Civil Rights suggests an entirely new geography of Los Angeles based on both activism and geopolitics. 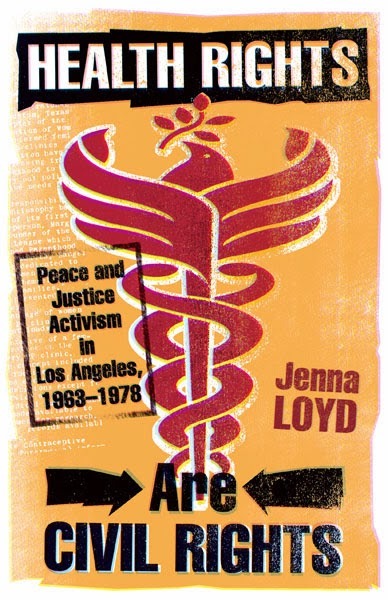 Jenna M. Loyd makes pathbreaking connections between health, war-making, race, and the environment that offer us a new way of viewing midcentury Los Angeles. An essential text for all scholars of Los Angeles, health, race, and activism." 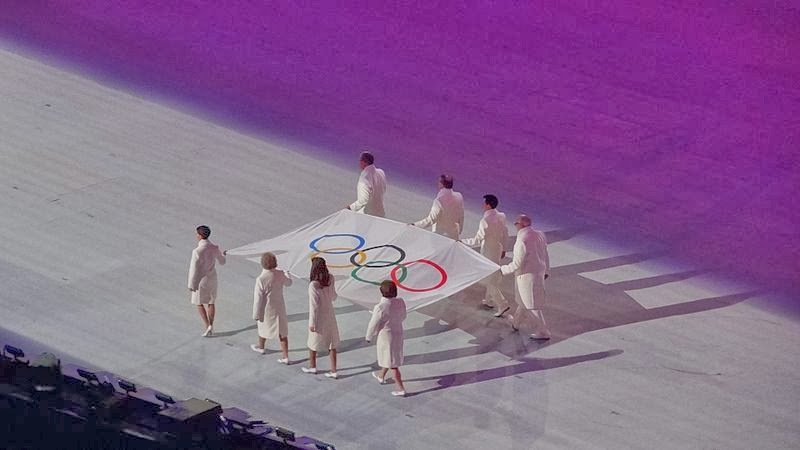 A scene from the opening ceremony of the 2014 Olympics in Sochi, Russia. Grant Farred offers a penetrating new analysis of "the event" from a surprising source: Sport. Sport confounds us. It confounds us for a reason ripe with the following paradox: sport does what it is supposed to do and when it does that, we are totally surprised. We know that anything can happen in sport so we watch sport expecting the unexpected and yet when the unexpected happens it still catches us off guard. This is the guiding premise of In Motion, At Rest: The Event of the Athletic Body: the sport’s event surprises us. 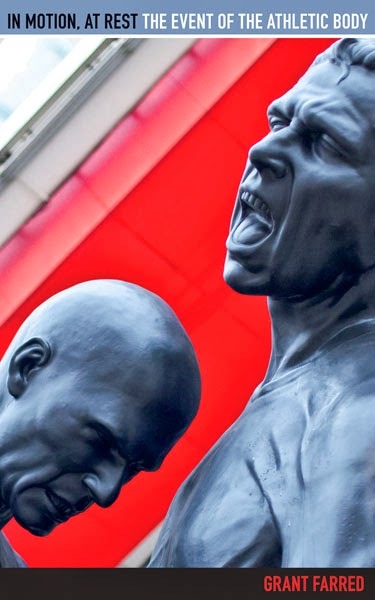 It does not matter whether it is a basketball player, Ron Artest, or a footballer, Eric Cantona, ascending into the stands in Detroit, or the coup de boule – one footballer headbutting another in the World Cup final as happened in 2006 when Zinedine Zidane rammed his head into an opponent’s chest. We are never prepared for the event because we do not know that will what will spark the event into life. As we watch the Sochi games and recall the buzz surrounding them a few weeks prior to their opening, we feared certain specters would haunt us. Will Vladimir Putin’s heavy-handed approach to security, for example, make the winter Olympics in Sochi safe from the threat of “domestic terrorism”? Or will it be gay-rights activists or triumphant athletes (think the black power salute of Tommy Smith and John Carlos in Mexico City, 1968) who set things in motion? After all, it took no more than a corrupt official refusing a bribe from a would-be Tunisian street vendor, Mohammed Bouazizi, who then self-immolated, to ignite the Arab Spring and sweep dictators all across North Africa from power. The event is that occurrence which, we later recognize, transforms everything. It transforms everything even if we do not fully understand it in the moment of its happening. The effect of the event is such that it makes us think again about everything that happened, and everything that happened before and after it – and sometimes what happened long before and long after it. As such, the event, the moment in which everything is changed, is integral to sport and, more than that, it constitutes the very fabric of sport. It does not matter if nothing happens at Sochi, we watch these winter Olympics in full expectation of the Games hosting more than figure skating and the downhill slalom. Identifying the event as the first principle of sport, In Motion argues that the three events it critiques, Artest, Cantona and Zidane, can only be properly understood if they are approached philosophically. In order to think the event in sport in this manner, In Motion pairs each athlete with a philosopher. Each sport’s event is matched with a theory of the event best suited to it. To this end, Alain Badiou’s theory of the event is used to read Artest, Gilles Deleuze’s work on the cinema forms the basis of the Cantona chapter, and two French figures with deep Algerian roots, Jacques Derrida and Zidane, are paired. Sport, I argue, renders not only a version of the event – which is mainly understood as a political phenomenon a la the Arab Spring or 1917 or the collapse of the Berlin Wall – but the event itself in a way that it is seldom thought. The event can happen anywhere, of course; at a political rally, in the realm of global finance, at a rock concert. However, In Motion shows how sport makes opaque both the intensity of the event and the ubiquitous potential for the event in sport. The event is everywhere in sport so that we never know what might produce the event. A white fan at an NBA game throwing beer at a supine African-American basketball player; an English fan at a Premier League game hurling ethnic invective at the opposing team’s French player; an Italian footballer saying something, we still do not, these many years later, know precisely what, at the French captain playing in the last match of his career in the World Cup Final. Any of these single acts set in motion an event that gathered into itself, say, the discourse of race and racism in the U.S. (Artest), about xenophobia in England (Cantona), about the politics of migration, republicanism and religion in France (Zidane). When the event happens in sport it draws everything toward it so that no aspect of social life is excluded. Imagine what ghosts an event in Sochi might spur into life. In reading three events, In Motion reveals the particular force of sport and the ways in which the event in a basketball arena or a football stadium changes everything. The work of the event is, above all else, to make us think and Zidane, Artest and Cantona, in their various ways, compel us to reconsider our understanding of the event and, as significantly, they both illuminate and extend the theories offered by Derrida, Deleuze and Badiou. In Motion makes us think about how we approach sport again. Or, ask why we have not yet thought the event in relation to sport. Most importantly, In Motion does not so much “makes sense” of sport – of what takes place on the court or on the field – as reveal the philosophical sense of the sport’s event. There is no other social practice, the political rally apart, maybe, where the prospect – there is almost a certain inevitability to it – of the event is so palpable, is so tantalizingly, perilously, close. To watch sport is to have a ringside seat – if a mixed sport’s metaphor might be allowed – at the event. We know this, of course, and yet we, for some inexplicable reason, do not. Courtesy of Ron Artest, Eric Cantona and Zizou, In Motion is a philosophical reminder of this. Grant Farred teaches at Cornell University. He is the author of four books, including In Motion, At Rest: The Event of the Athletic Body (forthcoming in March) and What’s My Name? Black Vernacular Intellectuals (Minnesota, 2003). "This is innovative work of the highest order, very smartly and incisively bringing onto the field two teams that very seldom meet in inter-league play: the philosophers and the sociologists of sports. 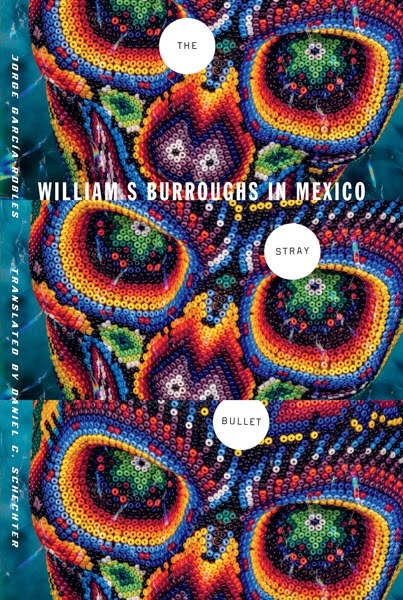 But in these pages there are also crucial interventions staged in cultural studies, race theory, globalization discourse, and media studies. In Motion, At Rest is a book that speaks to many audiences, without giving up its singular focus on the athletic body." 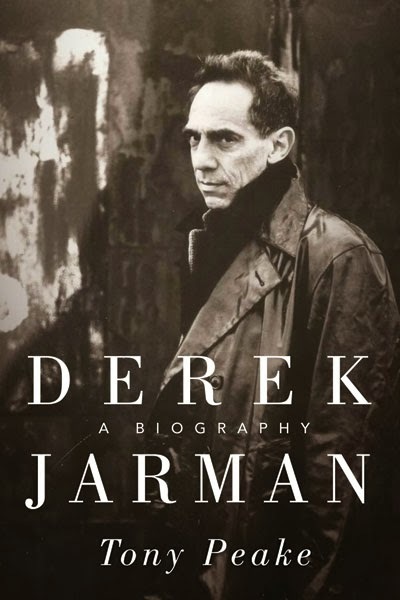 On the 19th of February, it will have been 20 years since Derek Jarman died, at age 52, of HIV-related causes. 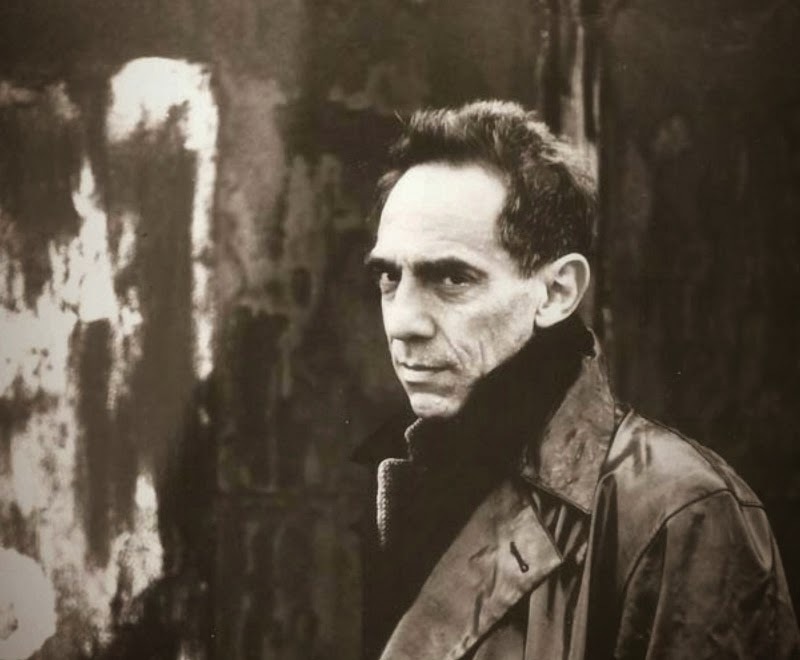 To mark the occasion, a range of activities have been planned in the UK, kicking off with Derek Jarman: Pandemonium, an exhibition at King’s College, London, where Jarman took his first degree before going on to study fine art at the Slade. Is Sewell right to be so damning about Jarman’s artistic achievements? And what about Jarman as an activist? What of Jarman the man? 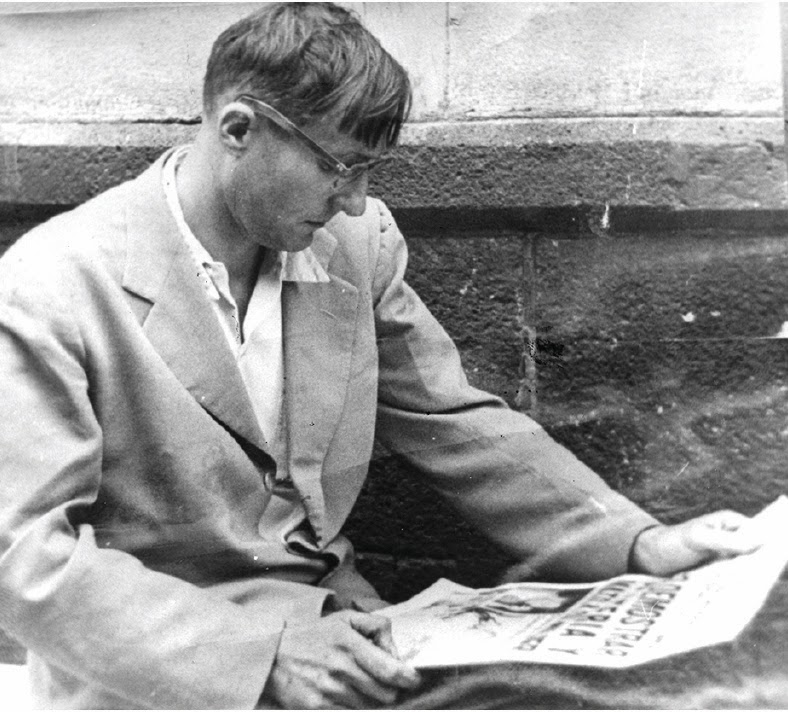 (Though Sewell is less harsh about the man, as it happens, allowing that he was ‘witty, kind, generous, determined, heroic’.) Or, last but not least, what of Jarman the writer, for he was prolific in this sphere too, as evidenced by the many titles of his still in print here. Happily, Pandemonium provides a thoughtful, perceptive and beautifully designed glimpse of both the man and the artist. The exhibition comprises just four rooms – the so called Inigo Rooms – off a corridor displaying some of Jarman’s art with, at the far end, a view of the garden he created in his final years at Prospect Cottage. One room centers on his time at King’s – a shelf of books that were important to Jarman, some copies of Lucifer, the student magazine of which he was arts editor. Another on Bankside and his studios across the river, where he lived in the seventies. There’s even a darkish back room where The Last of England, filmed in the months before Jarman learned he was HIV-positive, is being run at staggered intervals on five separate screens. With much, much more to come as the year progresses. 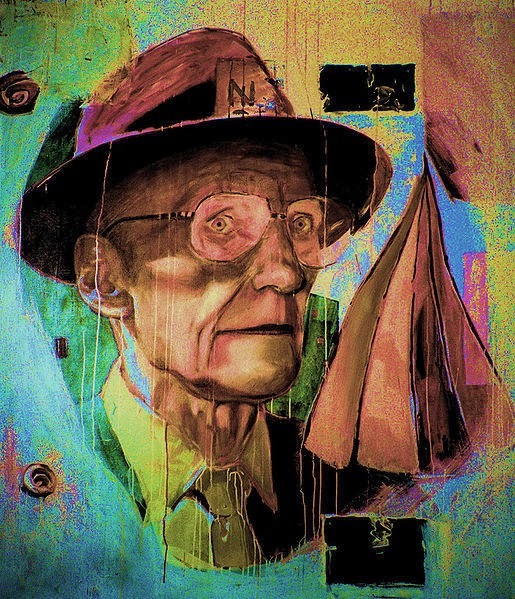 There will be other exhibitions; talks; a number of screenings, including a wide-ranging retrospective at the BFI, a showing of Andy Kimpton-Nye’s documentary and a Neil Bartlett installation based around The Angelic Conversation in King’s College Chapel on the night of Jarman’s birthday. There’ll be trips in the summer to Prospect Cottage and before that, on the 19th February itself, an event in the London Review Bookshop to celebrate the publication of a facsimile edition of Jarman’s poetry collection, A Finger in the Fishes Mouth. Will any of this change Brian Sewell’s opinion? Probably not. But if you don’t know Jarman’s work yourself, or you’d like to reacquaint yourself with it, or learn more about it, then 2014 offers a fine opportunity for you to make up your own mind. Derek Jarman: Pandemonium runs from Jan. 23rd through March 9, 2014. Tony Peake is the author of Derek Jarman: A Biography. He has also published two novels and also a writer of short stories. He was a friend to Derek Jarman and continues to serve as literary agent for his estate. For more information, visit tonypeake.com.